This offbeat Western is an interesting example of how the genre took a postmodern turn in the wake of The Wild Bunch. The script has a familiar western plot concept -- the idea of an outsider protecting a peaceful village from attacking outlaws -- but it is told in a manner that turns the familiarity inside out. In Barquero, the hero's motivation is to stand up for himself, not the people depending on him, and the villain is in greater danger of outsmarting himself rather than being bested by the hero. The storyline also has an undercurrent of commentary on the Vietnam War that gives the film an added dimension. On a more practical level, journeyman director Gordon Douglas keeps the narrative taut and exciting. His work might lack the distinctive touch of a more auteur-minded director but his sense of craftsmanship is very strong, a quality that is aided nicely by a lush, spaghetti western-styled score from Dominic Frontiere and sharp lensing of the outdoor locales by Jerry Finnerman. 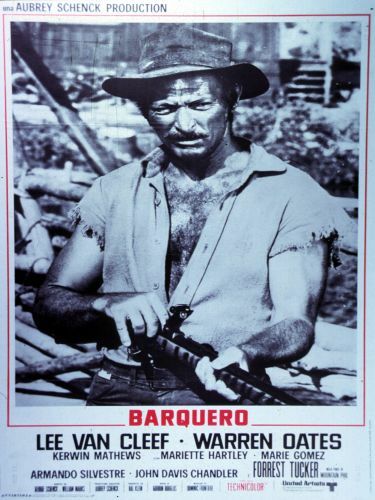 Barquero also boasts strong performances: Lee Van Cleef is perfectly at home as the antihero of the title, delivering a stoic performance with the right undertone of menace, while Warren Oates balances Van Cleef's work with an intense, charismatic turn as the troubled head of the outlaw gang. There are also fine supporting turns from Mariette Hartley as a coolly calculating villager who tries to tempt Van Cleef from his individualist path and Kerwin Matthews as Oates' stylish second-in-command but the big scene-stealer is Forrest Tucker, who threatens to walk away with the movie thanks to his witty, effortlessly charming turn as Van Cleef's mountain man ally. In short, Barquero is something of a lost treasure for Western fans and has enough unique elements to draw in the general cult-movie crowd as well.